Imigongo paintings are a truly indigenous Rwandan art form. Imigongo were originally created and developed by Kakira, the son of the king in the Kibungo region in the east of Rwanda near the Tanzanian border, who used them to decorate the interior of his dwelling. Simple, classic abstract motifs and stark, modern colors characterize the original imigongo designs. In original, the artists use natural pigments ranging from white and black to ochre. I have found this Imigongo art in one of the few shops, which sells „traditional african artwork“, especially spears and masks and so on. These squares are made of wood – no cow dung was detected. 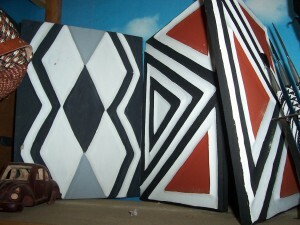 Whereas the traditional motifs are geometrical, since a couple of years, more modern pattern have also been used in the Kigali of today.